You can equip your Ram 3500 with wheel-to-wheel side steps. These steps allow you to easily access the bed of the truck. They also have a tubular shape that improves aerodynamics for enhanced performance efficiency. 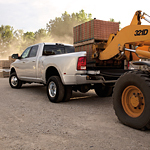 The class-exclusive RamBox Cargo Management System is featured with the Ram 3500. This comes with a number of features that include a cargo-view camera, LED bed lighting, a ParkView Rear Back Up Camera, the ParkSense Front and Rear Park Assist System, and a truck bed divider/extender. The cargo box can be drained and is durable, and you can remotely lock and unlock the cargo box when you choose the AllSecure Central Locking System.